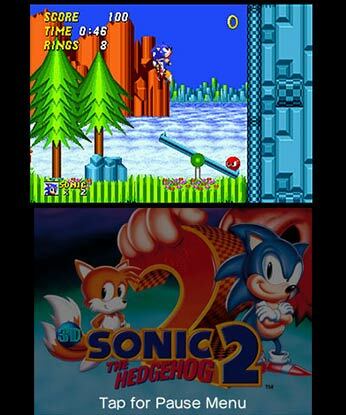 3D Sonic The Hedgehog 2 is remastered in 3D and full of new features! Is the Chemical Plant Zone your favorite stage? 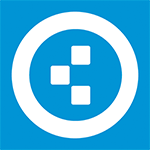 Use "Stage Select" and start running wherever you want! Run fast without worrying about your rings. Cut your losses by choosing Ring Keeper Mode—only half your rings will be lost after taking damage! Keeping your rings and stopping Dr. Eggman's evil scheme is important, but don’t forget to take some time off from saving the world to play against your friends in the 2 Player VS and CO-OP Mode using Local Play! Sonic the Hedgehog 2 is a game of massive highs and crushing lows. Thankfully, M2 and Sega have made those lows much less frustrating in this 3D version, making this the definitive way to play this imperfect, but essential, classic. Sega has shown a lot of care for its classics with its collection of 3D remasters and 3D Sonic the Hedgehog 2 maintains those lofty standards. It makes great use of the handheld’s 3D to refresh its already gorgeous level design and offers a slew of options for players looking to experience the best of the game with minimal frustration. Though some elements haven’t aged well, the level design and music are still superb, and ultimately 3D Sonic the Hedgehog 2 is likely the best way to experience an irrefutable classic. 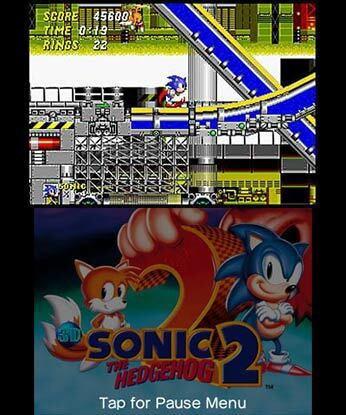 Sonic the Hedgehog 2 captures both Sonic and Sega at its best. This games has appeared on a huge number of platforms in recent years; but as usual, M2's efforts are a cut above the rest. Unless you're wild to play through the Hidden Palace Zone or you have a Sega Genesis at home, this is the version to own. Anyway, the 3DS version is nice. I like that Sega actually puts some effort into its 3DS rereleases, adding options to play the Western or Japanese versions of the game and offering various tweaks to the way the software is presented. It’s a step beyond what Nintendo does with its own “3D Classics” releases, and it’s appreciated. That’s pretty cool. 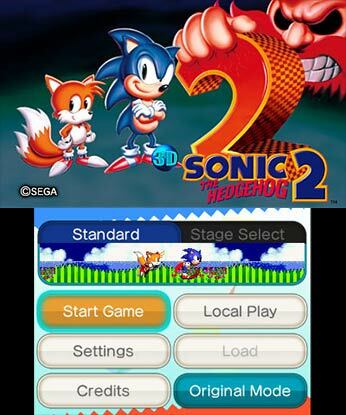 Sonic fans will already have made their mind up and rushed onto the eShop to purchase, but if you haven't made the leap yet do yourself a favour and pick up 3D Sonic the Hedgehog 2 as soon as you can. Simply put, this is Sonic at his very best and a platforming masterclass. Now if only Sega still made them this good; after all it has been ages, right? Nintendo may have quit making its 3D Classics long before any major favourites could make it out the door, but SEGA seems fine with releasing many of its heavy hitters in this form. 3D Sonic the Hedgehog 2 is one of those heavy hitters, incorporating the greatness M2 has worked into all of its recent remasters, and should not be missed. Aun con todo, es un modo algo tontorrón, y el principal atractivo sigue estando en el modo individual. Eso sí, tampoco es perfecto. Los niveles especiales en pseudo 3D han envejecido mal, y aunque con el efecto 3D estereoscópico activado dan buena sensación, no son de lo mejorcito de 3D Sonic 2… Son, quizá los únicos dos lunares del juego, porque todo lo demás, banda sonora (obligatorio escucharla con cascos), diversión o ritmo de juego sigue siendo tan flipante como hace más de 20 años. Uma vez mais a M2 mostrou o seu afecto por outro clássico Sega. Produziu um belíssimo trabalho ao revisitar esta verdadeira pérola da década de 1990. 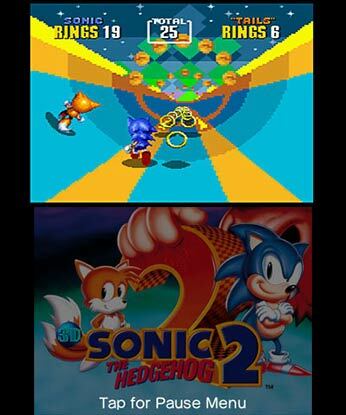 Sonic The Hedgehog 2 é provavelmente o melhor jogo com o nome Sonic e é sem dúvida um dos melhores jogos de sempre. Um verdadeiro clássico que teve um tratamento merecido. Obrigatório para os nostálgicos possuidores da Nintendo 3DS. Sebbene il confezionamento del pacchetto sia un gradino sotto rispetto ai migliori lavori di M2, soprattutto per la mancanza di extra consistenti (il Keeper Mode è una buona idea, ma non basta) e del download play per il multigiocatore in locale, 3D Sonic the Hedgehog 2 è un'altra piccola perla che va ad aggiungersi ad una collana imprescindibile per ogni amante dei classici Sega. 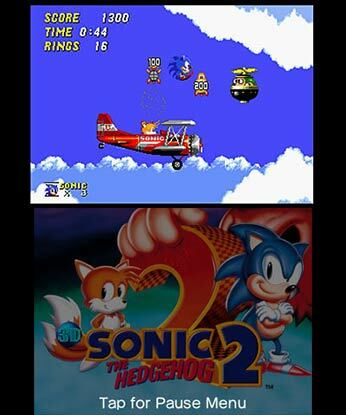 Già uno dei platform più adrenalinici e spettacolari all'epoca della sua uscita originaria, 3D Sonic The Hedgehog 2 passa bene l'esame del tempo, proponendosi, anche alle nuove leve videoludiche, come un'alternativa di valore agli ottimi giochi a piattaforme che 3DS può vantare. Non è un gioco su cui il tempo non abbia lasciato alcun segno del suo passaggio, ma rimane ottimo di per sé, e l'usuale, fantastico lavoro di M2 rende questa la versione definitiva. Aggiungete il prezzo al solito bassissimo e non c'è motivo di non consigliare 3D Sonic The Hedgehog 2 a nostalgici e neofiti.